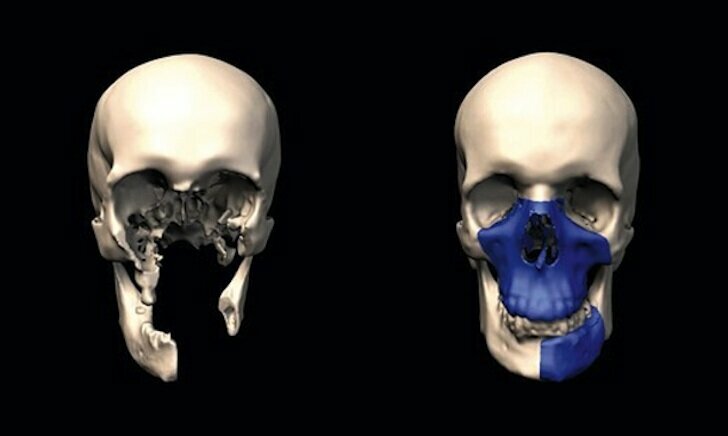 Belgian' first full-face transplant was performed in January -- using 3D printing to streamline the procedure. Photo credit: Wired. The July 2012 issue of Wired magazine has an article about how a 65-strong medical team at Ghent University Hospital, headed by Phillip Blondeel, performed the country’s first full-face transplant. What’s really fascinating, and why we’re bringing it up here, is that the virtual pre-operative plan the surgeons followed was devised by the CMF (cranio-maxillo facial) clinical engineers at Materialise, a Belgian 3D-printing company. This was the world’s nineteenth face transplant, but it was the first time that the procedure was fully planned digitally like this. First, engineers scanned the patient’s face with CT scanner. Then they used 3D visualizing software ProPlan CMF to digitally examine the defects so they could 3D print anatomically correct models of what healthy bones in the man’s face should look like. Printed “guides” were then used as a reference during the surgery, sitting on the donor’s face so the surgeon knows exactly where to cut.